This article contains multiple example strategies which trade according to cross of two indicator lines. The first two examples work with any feed but the tick feed - one simply chooses the feed type and parameters in strategy parameter dialog on strategy start. The third example works only with time period aggregation feed. 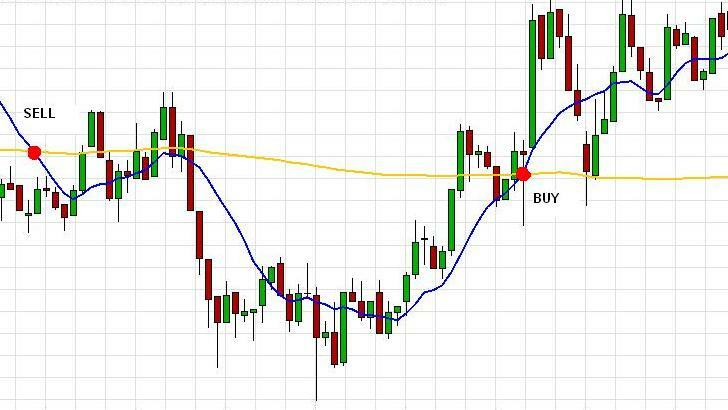 Consider a strategy which trades according to SMA cross direction. On fast SMA going below slow SMA it buys, on the opposite cross - sells. * The strategy trades according to SMA trend. * On up-trend it buys and on down-trend - sells. Consider adding a couple of visual features to the previous strategy. That is, a chart of the chosen feed gets opened and on that chart the correct indicators get plotted. Moreover, an OHLC informer object gets added to the chart and we configure it such that it shows the indicator values. And finally we add a signal chart object on every cross of the indicator lines. * The strategy trades according to SMA cross direction. * On fast SMA going below slow SMA it buys, on the opposite cross - sells. * and adds the indicator values to the OHLC index. IChartDependentChartObject signal = isLong ? The filteredSma90 and filteredSma10 arrays first element (index 0 ) contains a next-to-last sma value and second element (index 1 ) contains a last candle sma value. The strategy contains 3 configurable parameters: trade instrument, indicator period and indicator filters. Method onTick contains all trade logic. SMA10 crossover SMA90 from UP to DOWN , the strategy close existing long position and create a sell order if sell order not created before. SMA10 crossover SMA90 from DOWN to UP, the strategy close existing short position and create a buy order if buy order not created before.